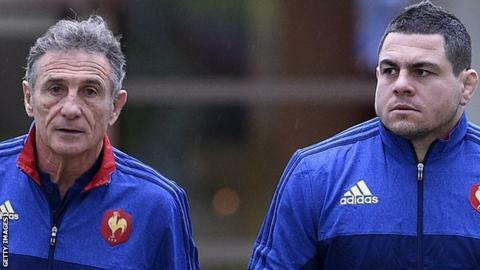 Wales fly-half legend Jonathan Davies says France's will to win in the Six Nations is a worry for Warren Gatland's team on Friday in Cardiff. The pundit and ex-Wales captain says "everything points to a Wales win". But the manner of France's victories over Italy and Ireland has left Davies wary of their "desire" to succeed. "They've won both games by the will to win, for supporting (coach) Guy Noves and Guilhem Guirado, the captain," Davies told BBC Radio Wales. "And that's the one thing that worries me. "Everything points to a Wales win, but the desire of the French is back and who knows what will happen then." However, the former dual code international added: "I just can't see what pattern they're trying to play and I've seen them twice this year. "It's difficult to analyse them." France are scheduled to name their team on Wednesday evening in Cardiff. Wales coach Warren Gatland has made three starting changes, bringing Alex Cuthbert back at wing, Dan Lydiate at flanker and Bradley Davies at lock for the injured Luke Charteris. Cardiff Blues' Tom James makes way for team-mate Cuthbert and Justin Tipuric drops to the bench as fellow Osprey Lydiate returns to the back-row. Davies felt James was "a bit unlucky" to lose his place after winning two caps in the tournament following a six-year absence. "There's not much difference between the two wingers Cuthbert and James," said Davies. "Luke Charteris gives us a big advantage in the line-out, the way he disrupts the opposition," he said. "His work-rate is immense, but we're lucky to have a substitute like Bradley Davies and one thing he does maybe better than Luke Charteris is he carries the ball well." Blues boss Danny Wilson was "thrilled" for Cuthbert, but "disappointed" for James. Wilson said: "I'm thrilled for Alex. He's worked extremely hard since being back from the World Cup and his performances, his hunger, his enthusiasm for the game have been great and put him in the position where he's got himself back to be selected. "Obviously disappointed for Tom James to miss out - another guy who has been playing really well for us." Meanwhile, prop Samson Lee hopes he and former Wales under-20 front-row colleague Rob Evans can enhance their reputations against France. Lee has held off the challenge of Exeter's Tomas Francis while fellow Scarlet Evans' emergence has seen Wales' record cap holder Gethin Jenkins come off the bench in the draw with Ireland and win over Scotland. Lee said: "In the first two weeks of the campaign, our scrummage has gone well for the ones that start and the ones that come off the bench, so I can't see why we can't put in a good performance against the French."